'God retires' screamed the headlines of all the news papers yesterday and today. There are three full pages in tribute to this legend in The Times of India, the leading publication. Is the hype being overdone? - Mathew Hayden, the Aussie great. Undoubtedly, if there has been one unifying force in a country of so much diversity as India, it has to be cricket. Short of war, nothing brings its people together in celebration and despair as cricket does. Unfair for the other sports? Possibly a reflection of our lack of eminence in other team sports. We are a pale shadow of the world beating Hockey team of yore.There surely are individual world champs like Leander Paes in Tennis, the emerging Saina Nehwal in Badminton..Does the country ever idolise them? The masses have not even heard of them. Indian Cricket has been replete with legends such as Sunil Gavaskar, the Spin quartet and later Kapil Dev, who captured the imagination of all of us including me. The Indian team, though, had an erratic run in world cricket, always known as 'poor travelers' due to our batsmen's inability to play on deadly fast, bouncy pitches overseas (read Australia, West Indies and South Africa). In a country starved of genuine, world champion sporting heroes came Sachin Tendulkar. His fresh, fearless approach to the game percolated to his team. What separates the greats from a true all time legend of the game is not just the contribution he makes to the team in terms of runs, wickets or fielding. Sachin with his fiercely competitive attitude, the willingness to face challenges and above all unquenchable desire to win gradually saw team India elevate from survivors to competitors and finally to world Champs in all versions of the game. Is this an exaggeration? Hardly. Even today, when he is well past his prime, all his team-mates swear by his contribution to their personal growth and his helping nature. I have been an avid follower of the game and have almost idolised Sachin over the decades. True class is rare, sheer genius is so rare that it has to be cherished when on display. The word genius itself is used very loosely nowadays. What is the one defining factor that marks out the all time greats of any sport? Dom Moraes, the late columnist and cricket fan, described it beautifully. -Mark Waugh, one of the most elegant batsmen to have played the game. Are all the practically insurmountable pile of batting records that he has set, notably the only one to have scored 100 international hundreds, the only proof his greatness? Sir Geoffery Boycott, at one time the scorer of most Test runs was regarded as a boring batsman. Legend has it that Ian Botham intentionally ran him out once! He was never considered a genius, just a technically correct opener.Sachin's greatness lies in the joy his batting has brought to all of us- whether experts, admiring rivals or his legion of fans around the world. This is perhaps the greatest accolade, coming from a batsman I consider superior to even Sachin. Another facet that separates the greats from the highly talented is consistency in all conditions, against all types of bowling attacks whether spin or extreme pace. Now if one has been delivering exactly this for 24 years, under the unbearable burden of massive expectations, he is an all time great. From Waqar, Wasim, McGrath, Lee, Donald, Pollock to Warne, Murali and Saqlain- he has faced them all with aplomb and tamed them. His ability to adapt overseas is supported by stats- he has a better average abroad than at home! Possibly lesser pressure from the home crowds must have been a relief.. In his prime, his attacking stroke-play in virtually any match situation against any attack made him so special. The full range of shots came out..the straight drive, on drive, paddle sweep, short arm pull and cover drive piercing the field, driving the bowlers to desperation! Coming to fond memories, which shall never fade, I agree with Steve Waugh's selection of his finest innings. The Aussie captain was at the receiving end of his swashbuckling performances more than once. Sharjah, Semi-Finals of a Triangular One-day tournament. India had to either beat the Aussies or score at a frantic pace to qualify. Sachin delivered and how! Half the side gone, he fought on valiantly. Midway, a desert storm interrupted the match. The reset target got stiffer. 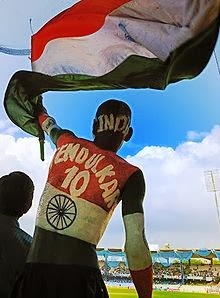 In the forced break, I got to see over television what defined Sachin. He neither took his pads off nor his helmet. There was a steely look in his eyes. India made it to Finals on the back of his magnificent hundred when the other stars flopped. Much later, when the Cronje Match-Fixing scandal broke out, I read the then Coach, Anshuman Gaekwad's statement. 'A few players, apparently involved in the ugly match fixing fracas, had agreed to flop in the match. On suspecting this, Sachin said "I'll win the Cup for you, Coach." There are so many other gems from his career, but his ton at Perth early in his career, on a really fast pitch where his team mates fell like nine pins is widely regarded as his best. His fighting ton against Saqlain and company on a breaking wicket when he all but took India to victory is my favourite. He was playing in great pain due to a back problem. And yet the thankless handful will say..'He's never been a team man, he doesn't win matches. You can't please everyone. On the other hand, if you are revered by a billion, then the critics are a drop in the ocean. ( a reflection of the dominance of Indians in the Infotech and allied industries in the US). Without Dravid and Lakshman Indian cricket will never be the same again. With Sachin's calling it a day, world cricket will be poorer- for he was a fantastic ambassador of the game he lived and breathed for so long. Legends are not born everyday. When a stars fades out, among the billions in the sky it is one star less.. When the Sun fades and calls it a day, it makes us sit up and take notice.